To create their best work, masters of all crafts invest a great deal in the best tools. Set yourself up for success with the Vintorio Waiter's Corkscrew! pull out even the most stubborn of corks for the perfect wine drinking experience. For a premium uncorking experience, the Vintorio Waiter's Corkscrew is the only tool you need! EXPERIENCING AN EXCELLENT GLASS OF WINE STARTS BEFORE IT IS POURED - The Vintorio Waiter's Corkscrew effortlessly inserts into and pulls even the trickiest of corks, thanks to its non-stick stainless steel worm and two-step double-hinged fulcrum removal system. Proudly show-off your professional uncorking skills at your next gathering with this fool-proof, high performance corkscrew! WEIGHTED AND BALANCED TO FEEL LIKE AN EXTENSION OF YOURSELF - The Vintorio Corkscrew's rubber-coated handle provides maximum no-slip grip control and leverage for even the weakest of fingers while feeling solid and velvety smooth in hand. You might find yourself caressing your Vintorio Corkscrew even when there is no wine around! PRECISION ENGINEERED FOR A PREMIUM UNCORKING EXPERIENCE - All spiral worms of Vintorio Corkscrews are precision made to have uniform diameters and spaces between each coil, which is the key to preventing breakage when entering or removing corks. No gimmicks here, just excellent design and high quality craftsmanship. 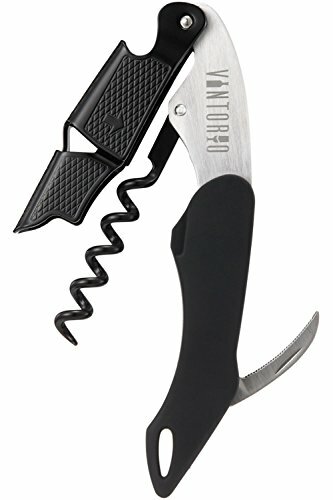 VERSATILITY MEETS DURABILITY - The Vintorio Corkscrew's fulcrum doubles as a bottle opener and the conveniently built-in foil cutter easily unfolds and has a long, curved, serrated edge to quickly and cleanly remove all types of wine foils. Everything you need to open a bottle of wine OR beer is conveniently available to you in one tool.